Our custom-made modern window styles and fantastic range of uPVC casement windows are a popular double glazing option and practical solution to transform any home. Looking for Modern Windows in Essex? Then the window company you should be speaking to is us – Eco Secondary Glazing. specialists in offering modern windows across Essex, Herts and London. Based from our head office in Buckhurst Hill, Essex, our team of uPVC window fitters are available and equipped to offer custom-made windows as well as a fantastic range of uPVC casement windows – all at affordable prices. These products are a popular double glazing option and practical solution to transform any home across the areas we cover. Eco secondary Glazing offers a wide range of ‘Tilt and Turn’ double glazed windows to fit every situation and all types of homes. Our uPVC windows are priced competitively and offer an adorable solution to each and every client. Our vertical sliding uPVC sash windows complement the appearance of any period, town or country home. Traditional design combines all the elegance of sash windows with all the benefits to create a modern windows in Essex, Herts or London homes. Our window company can offer double glazed units that are energy efficient. In turn this means reducing heat loss, drafts and fuel bills, especially in the winter period. Here you’ll be able to make your choice of modern window style, browse the wide selection of colour and glass options we have available and give your double glazed sash glazing its own individual look. Security – Latest security features include windows that have multi point locking systems, double locking handles and much, much more. Keep your home safe and secure. Bespoke build – Designed individually for your home with modern and traditional styles that are guaranteed for ten years and at an affordable price. Eco Secondary Glazing offer the highest in quality of uPVC windows from standard casements, to flush casement system, French opening windows, vertical sliders and many more. We use one of the highest brands of uPVC profiles. We manufacture and have a high quality control system to ensure all products that leave our factory are of the highest of standard. All installation are FENSA certified and we also provide a 10 year guarantee on all installations by Eco Secondary Glazing as well as a 10 year insurance backed guarantee from the GGFI. Eco Secondary Glazing use Liniar’s EnergyPlus range for unbeatable thermal efficiency. We use six-chambered EnergyPlus profile which offer unparalleled results and enables cost efficient double glazing to be used, achieving similar U-values and energy ratings to more expensive triple glazed windows with other systems. At Eco Secondary Glazing we like to offer a quick quoting time and lead time in supplying quotes for supply only as well as supply and install. We aim to quote within 48 hours. Supply and delivery time we aim to supply within 1 week of order depending on volume of order and glass spec. We guarantee a no longer lead time then 2 weeks maximum. We also offer free site visits for quotations and advice. At Eco Secondary Glazing we use the highest security Yale multi point locking system as well as a variety of glazing options, from double glazed to triple glazed. We also offer the upgrade of laminated security glass on all doors as well as low ground level windows for added security given you the confidence and protection of having a safer home. The contemporary style with improved light intake and fresh air to let the summer into your home. 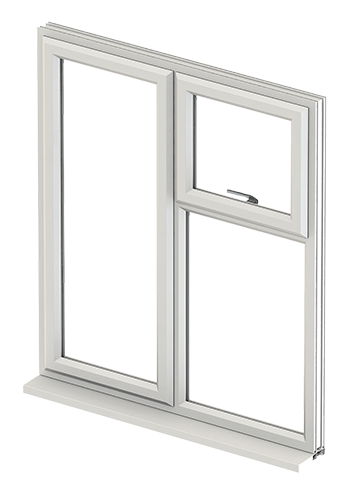 With high-performance and superb insulation for the cold periods, combined with the simple ’ tilt and turn windows’ opening system, this style provides you with a modern window that is extremely simple to clean, both on the inside and the outside. The elegant conservation grade vertical sliding PVCu sash window from Synseal provides all the benefits of period charm while retaining the high technology of PVCu at a cost-effective price.